Once you open yourself to the possibility of being created, life becomes a very different journey. The concept of creator influences questions of present purpose and future destiny. If life has an origin from a meaningful originator, then we’ve got a very different journey on our hands. In my life journey, I’ve met very few authentic atheists. When you dig deeper into the professed convictions of many atheists, you usually find an agnostic lurking in the shadows. Arguments against the existence of God usually gravitate to a conviction that God might exist, but He, She or It can’t possibly be the God of the Bible. In fact, many anti-God arguments are rooted in moral convictions; protestations such as “I can’t believe in a God that would send people to hell” or “I can’t believe in a God that would allow for such suffering” or “I can’t believe in a God who walks on water or who rises from the dead.” Most often, I find atheists dislike, detest or are indifferent to my God because they believe He doesn’t measure up to what they consider to be a God worth serving. Of course I am overgeneralizing, but I really don’t have time to express the nuanced positions of every single person on earth. Regardless, I’ve found an agnostic view of the divine to be the more normative response to existence. In the agnostic camp, there is a strong conviction that one really can’t have strong convictions about a creator. God or some spiritual force might exist, but this divine force is so distant, vague or unknowable that it really isn’t possible to understand the mystery of our existence. Agnostic faith assumes a God that might exist has better things to do than worry about the orthodoxy of our moral choices. Then there’s Christianity. What do Christians believe? Well that depends on enumerable variations on a theme. The source material is supposed to be biblical, but that is up for much debate. Within our popular culture discussions, Christianity has become like the word balance. Everyone says they are trying to live a balanced life, but no one really knows where balance exists. One man’s measured response is another man’s lunatic expression. For some, Christianity is a synonym for democracy and free market capitalism, for others, Christianity is a philosophy rooted in wise teachings and morally edifying stories. Some see Christianity as doctrinal distinctives or political perspectives, while others view Christianity as a confession of faith or a life of unique behaviors, values and expressions. For some, Christianity is synonymous with hypocrisy, for others, it is an expression of spiritual integrity. Some emphasize Christianity as grace, others highlight holy living. For many, Christianity is an amalgamation of all, some or possibly none of the above. Once again, I am oversimplifying as I’m not that interested in spending the time necessary to express a nuanced perspective of every person who claims the name of Christ. As for me, I’ve spent much of my life trying to figure out what most distinguishes Christians from the rest of the people on the face of the earth. In other words, what is the distinguishing characteristic that sets Christians apart from other faith or lack of faith expressions. Is it theology, is it political perspective, is it our culture? What identifies the Christian, other than claiming the word Christian? As a Christian, I identify the Bible as a key bit of source material for the expression and logic of my faith. When I examine both the Old and New Testament, I find a consistent demarkation that sets God’s chosen people off from the rest of the people on the face of the earth. God’s interaction with Moses and the children of Israel best exemplifies this biblical theme. In the Exodus story, God leads the Israelites out of Egyptian slavery through the use of signs, wonders and plagues. Once freed from Egyptian captivity, the Israelites find themselves wandering in the wilderness with a very limited sense of direction and purpose. They know they have been set free from captivity and are heading towards a promised land, but they have little knowledge of how they shall behave as they move towards their new land of promise. To deal with this dilemma, God communes with Moses on the holy hill of Mount Sinai. While Moses communes with God at the top of the mountain, the Israelites rebel against God at the bottom. Which is not only terribly sad, but also terrible ironic. At the same time God is instructing Moses on how the Israelites are to abide with Him, the Israelites are rebelling against the few commandments they have already received. When Moses comes down from the mountain with the ten commandments as well as elaborate instruction for the building of the Ark, Tabernacle and priesthood, he is confronted with chaos in the camp of God. While Moses was away with God, the Israelites had formed and erected a golden calf idol to image their rescuing God. “The LORD said to Moses, ‘Depart; go up from here, you and the people whom you have brought up out of the land of Egypt, to the land of which I swore to Abraham, Isaac, and Jacob, saying, ‘To your offspring I will give it.’ I will send an angel before you, and I will drive out the Canaanites, the Amorites, the Hittites, the Perizzites, the Hivites, and the Jebusites. Go up to a land flowing with milk and honey; but I will not go up among you, lest I consume you on the way, for you are a stiff-necked people” (Exod. 33:1-3). “Moses said to the LORD, ‘See, you say to me, ‘Bring up this people,’ but you have not let me know whom you will send with me. Yet you have said, ‘I know you by name, and you have also found favor in my sight.’ Now therefore, if I have found favor in your sight, please show me now your ways, that I may know you in order to find favor in your sight. Consider too that this nation is your people.’ And he (God) said, ‘My presence will go with you, and I will give you rest.’ And he (Moses) said to him, ‘If your presence will not go with me, do not bring us up from here. For how shall it be known that I have found favor in your sight, I and your people? Is it not in your going with us, so that we are distinct, I and your people, from every other people on the face of the earth?’ And the LORD said to Moses, ‘This very thing that you have spoken I will do, for you have found favor in my sight, and I know you by name'” (Exod. 33:12-17). Moses understood the presence of God to be the ultimate factor that distinguished God’s chosen people from the rest of the people on the face of the earth. More important than the blessings, more important than the promises, more important than the holy commandments and the righteous edicts was the presence of God. For Moses, a promised land was more than a destination, it was a relationship rooted in the abiding presence of God. It is no surprise that Moses wore a veil over his face to honor the presence of God. Moses desired that his authority would not come from the strength of his words or the logic of his edicts. Rather, he desired for the nation to see God’s glory on his face. When Moses met with God, his face would radiate and reflect God’s glory. When Moses entered back into the camp, with the holy words of God, he made sure to remind the Israelites that the words were accompanied by glory. Each time Moses removed the veil to speak God’s holy words, the people where confronted with Moses’ authority. It is God’s presence, God’s glory from beginning to end that gives Moses the necessary authority to lead a “stiff-necked” people. In the New Testament, we gain an increased understanding of the importance of abiding in God’s presence. We learn through the words and actions of Jesus and His disciples that authority and power go far beyond words or proper orthodoxy. Rather, God’s Kingdom advances when God is present. God’s authority is established when individuals make room for the abiding presence of God. Before Jesus goes to the cross as a sacrifice for our sins, He speaks with His disciples about how the Kingdom will advance once He is glorified. His words demonstrate the authority that is rooted in abiding with God. “If you love me, you will keep my commandments. And I will ask the Father, and he will give you another Helper, to be with you forever, even the Spirit of truth, whom the world cannot receive, because it neither sees him nor knows him. You know him, for he dwells with you and will be in you. I will not leave you as orphans; I will come to you. Yet a little while and the world will see me no more, but you will see me. Because I live, you also will live. In that day you will know that I am in my Father, and you in me, and I in you. Whoever has my commandments and keeps them, he it is who loves me. And he who loves me will be loved by my Father, and I will love him and manifest myself to him” (John 14:15-21). Jesus promises the disciples that they will not be left as orphans. God will not abandon them with just future promises or present commandments. Instead, He will be in them and with them through the power of the Holy Spirit. More than just walking alongside God, God will abide in His creation. After the ascension, the Holy Spirit will be poured into the hearts of all flesh who call upon the name of Jesus. Sons and daughters, male and female, young and old will all have access to the abiding presence of God. It is this abiding presence that distinguishes the New Testament church from the rest of the people on the face of the earth (Acts 2). Jesus’ promise is clear, “If anyone loves me, he will keep my word, and my Father will love him, and we will come to him and make our home with him…These things I have spoken to you while I am still with you. But the Helper, the Holy Spirit, whom the Father will send in my name, he will teach you all things and bring to your remembrance all that I have said to you” (John 14:23-26). Jesus promised His disciples that God would make His home with anyone who loved Him. This is not a promise concerning heaven, rather it is the present reality of every Christian who has become a new creation in Christ. Through the cross of Jesus, our sins have been forgiven and the righteousness of God has been established in our hearts. Not only have we been made righteous, but we have become temples of the most holy Lord where God abides in us and with us through the power of the Holy Spirit. As Paul says to the Corinthian church, “Or do you not know that your body is a temple of the Holy Spirit within you, whom you have from God? You are not your own, for you were bought with a price. So glorify God in your body” (1 Cor. 6:19). As Moses’ authority was rooted in the abiding presence of God, our authority has been confirmed by the abiding presence of the Holy Spirit. However, unlike Moses’ fading glory, “…we all, with unveiled face, beholding the glory of the Lord, are being transformed into the same image from one degree of glory to another” (2 Cor. 3:18). In other words, our glory does not fade! In the New Testament era the presence of God goes with us. God’s presence is both on the top of the holy mountain and in the camp at the base of the hill. Immersed in God’s presence, we radiate a Kingdom rooted in God’s abiding glory. Through the work of the cross, Jesus has made a way for us to abide with God. When we enter into the new birth of salvation, we are brought into a new home of abiding with God. “If anyone loves me, he will keep my word, and my Father will love him, and we will come to him and make our home with him” (John 14:23). Too often, we present faith as the acceptance of a doctrine or theological distinctive, rather than the embrace of an eternal relationship. We are sometimes more concerned with right thinking than we are with right abiding. With this in mind, I’d like you to consider the condition of your relationship with Jesus. Or more specifically, what does your spiritual house look like? That home God has provided for you, that place of abiding with your creator, what does it look like? Early on in my ministry as a pastor, I often found myself frustrated with my ministry effectiveness. I felt like I was failing in my calling to be a fruitful minister of the gospel. Certain times felt worse than others, such as when I attended my denomination’s yearly gatherings. Although the events were meant to strengthen my faith and calling, I frequently became discouraged as I compared my meager fruit to the superstars of faith that invariably inhabited the conference schedule. Hearing success story after success story did not create the intended result of inspiration. Instead, I usually felt discouraged and even discarded, as if I had been passed by when it came to a ministry anointing. At one conference, I felt particularly desperate for a word of encouragement. In fact, I came to the three day gathering determined that I would hear something from God that would help me with my current ministry assignment. By the final meeting of the final day, I realized I had not encountered one speaker strong enough to lift me out of my ministry pit. As the final closing prayer of the conference was finished, I sat alone three rows from the back of the auditorium, with my head down in what might have seemed like prayer or desperation to the casual observer. As I sat there with my eyes closed, I resolved that I was not going to get up or open my eyes until God gave me a word. It was at this moment God gave me a clear picture that radically changed much of my ministry motivation. While my eyes were closed, I saw a clear picture of myself running down a long, straight dirt road in the middle of what seemed to be an abandoned field and farm. There was an old run down, two story farm house about a quarter mile in front of me. As far as I could see, there was nothing surrounding the house but barren fields. There were no other houses or neighbors in sight. As I ran down this straight road toward the dilapidated farm house, the sun was slowly setting and the sky was beginning to darken. I was frantic in my pace, desperate to get home before night fell. As I reached the house, I ran up onto the porch, opened the screen door and headed directly upstairs without looking to my right or left. At the top of the stairs, I opened the door to the first room on the right. In the corner of that room sat a small, spring bed with a tiny white mattress. I jumped in the bed, pulled the covers over my eyes, and immediately went to sleep. At that point, the vision ended. God was gracious enough to remind me of my inheritance. He let me know that my faith was more than a journey, more than a testimony and far more than a calling. Rather, through the cross, God had given me eternal, abiding relationship with my heavenly Father. In Jesus, I am more than just saved, I am home! I abide with God and God abides with me. Thanks Doug for writing that just for me. I was probable only a few sections to your left during that conference. If we would have lifted our heads maybe we would have noticed each other.. I just have a box spring and a small garbage in my room. And I keep the windows free of curtains so I can see others really nice places and moan about how mine isn’t. I am a bit confused with the photo you used. What is the symbolism of it? Thanks. The photo doesn’t really match up with anything. I just like matching interesting images with my blogs. That sign hangs on our kitchen wall. 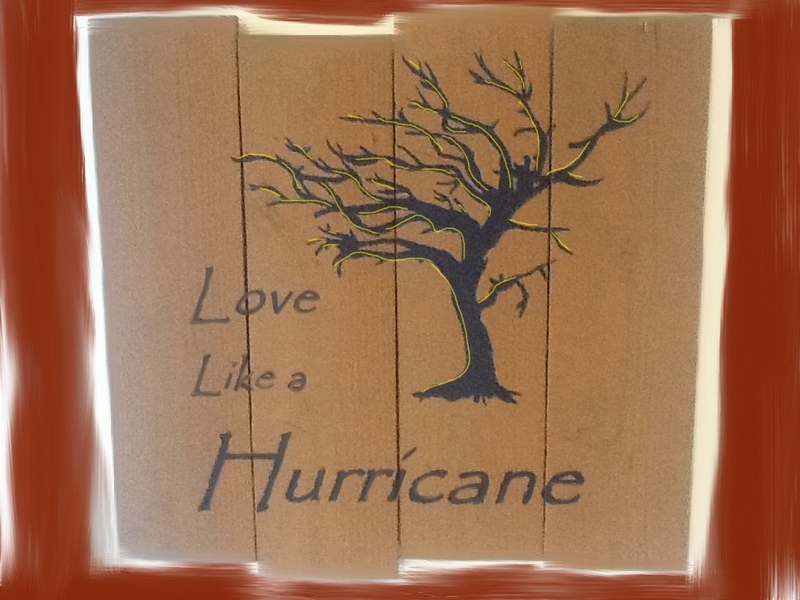 Although the words are from a song that says, “He is jealous for me…loves line a hurricane, I am the tree…” So maybe it fits. Well said Doug! I’ve been on the “intimacy with Jesus” journey since we planted the church… but it took me more than a year to get out of my room. Everytime I felt his presence, I ran away because it was so overwhelming and… realvealing! The truth of his love sets us free but it is terrifying like a hurricane becasue it sweeps away everything we tried to be secure in, and then… we find that his peaceful presence is all we need, I know that I have so far to go in letting the intimacy occupy my whole house but I go the convention now feeling no shame at all for my very small church. You laid out the reality of it so very well… I posted this on facebook! Thanks…it is amazing how difficult it can be to truly embrace God’s acceptance! He actually wants to be with me. I was just wondering, considering your somewhat loose but yet true distinction between ‘atheists'(that group who might believe in a God, but just not necessarily the God of Christianity) and Christians, if there can be a third group called the ‘anti-theist’, basically the one who sees all religion–especially Christianity in the western world, since it is still the major religion out west in some parts–as necessarily needing to be removed. It might be a tad too much to suggest this, but I do know of those who claim that the best thing that would happen in this world is if organized religion, especially Christianity, is removed from the face of this earth. This group blames all the evils of this world on Christianity–or if not, religion–alone and go on a singular track that once removed, the world would be a better place.